Science Caturday: How Cold Is It? Much of the central and eastern US has experienced record low temperatures over the past week, around 40 degrees below seasonal norms. Just how cold is it? Let’s ask this cat. 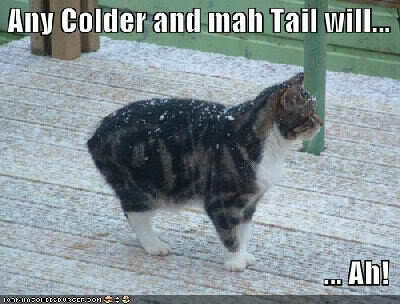 This entry was posted in Science Caturday and tagged climate cat, science lolcat, weather lolcat, winter lolcat. Bookmark the permalink.